I’d like to talk to you today about how EFT has helped me to overcome serious mental health challenges in the hopes that increasing numbers of us will feel able to bring our knowledge and experience to this field. I will tell you a little of my own story and I’ll go into some detail about how I have used tapping to facilitate my recovery over the past year. Hopefully you will be able to extract something useful from this to use in your own practice with yourself or with others. I feel as though I have had a bit of a whirlwind romance with EFT, as do many of us when we are first introduced to it! I have had to adapt how I worked with it but I have also stayed true to the core principles as taught to me so soundly by Gwyneth Moss and as I interpreted them from Gary Craig’s training DVD’s. I’ll give you some examples of the ways in which I have worked with myself and of how that has changed over time. I have found that working with myself has been incredibly useful, crucial even; to the work I have done with clients. We are only able to go with someone as far as we have been ourselves, the further I can go with my own healing and development, the further I can accompany another. I have experienced over and over the phenomenon that just as soon as I have had a personal breakthrough or discovered a new technique or variation to help myself, I have been called on to use that learning, sometimes immediately afterwards, with a client. I had experienced an almost continual state of anxiety, depression and dissociation, interspersed with periods of feeling well, sometimes too well and slightly manic, since my early teens. I was absolutely convinced that if I went to the Doctor and told her what was really going on in my head that I would be locked up. So I didn’t. I kept a very tight lid on what was really going on even from myself. For a lot of the time, and for many years, I managed to present a ‘good’ picture to the outside world that was very different to the internal chaos and struggle that was really going on. What was really going on was a very mixed picture. I was experiencing an internal world that was chaotic, confused, fragmented and ever changing. I felt different all the time, sometimes within the hour, definitely within a day. I could feel like dying, flying, screaming, laughing or running away. And of course the way I thought I could help myself with this changed all the time too. Over the years I tried ‘sensible’ things that weren’t always that helpful, like Counseling, Psychotherapy, Psycho-analysis, Reiki, Spiritual Healing, Homeopathy, Diet, Exercise and DIY. I also tried not so sensible things that always felt helpful (at the time!) but were distressing for the people around me, like binge drinking, shopping, shoplifting, self harm, risky behaviour and crazy schemes. This state of anxiety and inner chaos was very tiring and meant that I never really got anywhere because I was always changing the goalposts, and the field, and the football…but it was something that I just coped with. The depression was another matter. When the depression came it bought with it other ‘mad’ feelings. Feeling like I wasn’t real, or attached to my body, or feeling as though the world wasn’t real, or feeling as though the world wasn’t safe, there was no clean air to breathe and everyone was out to get me. !! Because I was so afraid of being locked up I didn’t go to see a Doctor about what I was experiencing until I was in my late 20’s. From then on my involvement with mental health services was a mixed blessing, at times I was grateful for the medication as it provided respite from intolerable feelings and did prevent me from killing myself. At other times it seemed to make what I was experiencing worse or I was so heavily medicated that I could not function as a parent, wife or human being. Every time I went to see a new Doctor, Psychologist or Psychiatrist they would change or alter my diagnosis. A diagnosis can be partially useful in that it can help you and other people better understand or empathise with your experience, it also enables you to connect with other people who share similar experiences to you. Mental and emotional confusion can feel very isolating and any experience of community, whether real or virtual, will help you to feel more connected and hopeful. The relationship that I have with my current diagnosis is one of interested non-attachment. Post Traumatic Stress Disorder and Dissociative Identity Disorder describe my experiences and internal world better than any disorder I’ve yet been labeled with, however I don’t want my identity to become bound up by them. And as I move further and further into wellness I also object to the term ‘disorder’. As I see it my madness has been a mysterious and magical force for good, which has protected me in the very best way it possibly could. Even the darkest parts of my journey and the most terrifying of my inner people have transformed into my wisest and most thorough teachers. When I first started using EFT it was purely as an anti-anxiety medication. I had been sent away from an EMDR therapist who felt that she was unable to help me, with Gwyneth Moss’s ABC tapping sheet. Little did this woman know just how helpful she had been. I used the 3 point calmer just on it’s own and was amazed. I had never found anything that could have that kind of immediate, long lasting effect, except for tranquilisers, and even those lose their efficacy over time. Everyone is amazed when they discover EFT for the first time but for someone who had lived at the mercy of their emotions this was truly revolutionary. My childhood memories were a no-go area, off limits, a battlefield of undetonated explosions. Any tapping that I did had to stay in the present and I did this by working very, very generally on things that were occurring at that moment. A moment-by-moment awareness of the present was not a mindfulness practice that I had learnt from Buddhism but what I had learnt through personal experience as a technique to keep me alive. In the past, sometimes my feelings of hopelessness, darkness or craziness had been so intense that I felt as though I was literally clinging onto a cliff edge with my fingertips. At any moment I could fall and would never recover and the only way to keep clinging, to keep hold of that tentative contact with the rock was to be utterly present in that one moment. If I looked back the past would overwhelm me, if I looked forward the future would annihilate me, the only place I was safe, and breathing, was the present and so I had to stay in that present moment or die (at least that’s what it felt like). I did this by noticing what was in the present moment and describing it to myself. ‘Chair, carpet, blue, crumb, hurt, ache.’ Sometimes I couldn’t even find words and I would simply count the moment by, second by second, ‘1,2,3,4,5,6,7,8,9,10, 1,2,3,4,5,6,7,8,9,10.’ This state could last for days, or even weeks but I would survive. I would hang on. Once I had tapping to accompany me through these moments however, I would be able to move into a different state within minutes and be back to my self in half an hour. !!! So I began my EFT practice by tapping very gently and cautiously, skirting around anything big, or anything that felt like it might lead somewhere big. I tapped whenever I was walking, or waiting, or panicking. A lot of the time I didn’t need words at all because my emotions were still fairly extreme so I was already well tuned in to whatever the problem was. I made very good use of the finger points, as these were inconspicuous while walking or in public. I had also found that if I was really distressed tapping on my face could feel like a violent act, or could lead me towards a violent feeling towards myself, whereas the finger points felt more distant and safe. I’ve since had this corroborated by several clients, particularly those who dissociate easily or self harm. I think now that what all this gentle, generalised tapping was doing was calming down all the rough, haywire edges, and it got me to a place where I was safely able to enter therapy and start working on my deeper issues with an EFT Practitioner. I would recommend this approach for anyone you’re working with, including yourself, who is particularly fragile and traumatized. There are different places in which we can begin but the very best is where our client is. If they have suffered from childhood trauma, known or unknown, they will be out here somewhere, so that’s where you have to begin, out here. And while they’re ‘out here’, the things they may say, may not make sense to you, that’s ok, just give them back to the client word for word. One of the biggest problems and obstacles to recovery for people who suffer from extreme anxiety, depression, dissociation or unusual beliefs is their feeling of isolation. There are often no words for the things that they are experiencing and hardly ever anyone to share their reality with. Tapping is a gift that we can give to ourselves and to others when we are having these experiences. Simply acknowledging, and accepting every bizarre, scary, unusual, crazy thought, word or feeling is all we need to do. Without questioning or analyzing or judging, just allowing this reality to be, to exist as it is, just for now. I had an experience of working with someone when for 2 hours I didn’t understand a single sentence that he was saying. He was obviously in great distress and in a state of profound depression. All I could offer was my undivided attention and presence as I sat with him, providing witness to his experience by listening deeply; empathizing with his emotions and offering his jumbled words back to him through the tapping. Towards the end of the session his face relaxed and his eyes cleared as he said the words ‘drumming, it’s like drumming’, with a soft smile. Perhaps he was talking about the rhythm of the tapping, or perhaps he was feeling as relaxed as he did when he was drumming. At any rate, somehow, just by being together with his darkness he had reconnected to his light. Apart from not digging for early memories, another precaution I had to take, and I would urge you to take with your complex trauma clients (and you won’t always know who these are because they won’t always know who they are, if they are dissociated with repressed memories) is to be gentle and wary when working with body sensations at first. Although I was fascinated by this technique I was aware that for me, working with somatic experience was also playing with a loaded gun because I could very easily slip into accessing body memories of the abuse that I had repressed and from there become overwhelmed and dissociated. For example, early on in my use of EFT, somewhere between Level 1 and 2, I was tapping for a reluctance to go to work. Tapping on the words and thoughts around this wasn’t touching it so I then went to the strongest physical sensation, which was of extreme anxiety in my stomach. I described what this sensation was like to myself while tapping and that reduced it. As I was tuning more deeply into the sensations in my stomach I became aware of the presence of a child. As I tapped I asked myself what is this stomach anxiety child like. The image that I received was horrifying, it was of a baby who was burned and black and vomiting from every pore of his skin. This was deeply disturbing and stopped me in my tracks. All I could do was what I knew, which was moment-by-moment witnessing, together with the confidence that tapping changed things. So I just did continuous tapping, describing what I was seeing and tuning frequently into the imagery to check how it was changing. As I did this the tension and disturbance within me gradually reduced until I could watch and witness as a protected, detached observer. The intense and manic vomiting in the imagery lessened and the baby lightened in colour until I was left with a baby who just seemed completely wiped out and was constantly oozing fluid. I let myself describe what I was seeing in simple words and then repeated those exact words back to myself through the tapping. ‘Constantly oozing fluid baby, completely wiped out.’ After that round I felt much better and when I returned to the imagery found that the child had vanished. At first this concerned me, but I didn’t feel scared, so I just had to trust my internal imagery, whatever was happening was the ‘right’ process for me. I noticed that the baby had left a blanket behind and this felt significant, as though the blanket held the experience, that the blanket had witnessed and seen things but the blanket was fine, the blanket was going to be ok. As I became aware of these thoughts I tapped with them too until I felt completely at peace and the blanket also disappeared from the image. I was blown away by this experience. Had I tapped into a memory or a frozen part of myself? I didn’t know. All that I knew was that the imagery was relevant and meaningful to me and that through tapping, something that at first seemed unmanageable, horrifying and distressing, transformed into feelings of relief, release, peace and well- being. Having discovered this way of working accidentally I then seized upon examples of anyone else who was combining imagery and EFT in order to affirm that this was a valid technique. I read about Imagineering and Inner Theatre and Betty Moore-Hafter’s work with parts and Gillian Wightman’s work with the anxious and dissociated. I was too cautious to work in this way by myself however, I had no way of knowing what else lay in wait in my subconscious and I considered myself lucky to have ‘got away with it’ this time. What I needed was to work with a skilled therapist and to find an EFT mentor for my practice who was experienced in this field, and I have been lucky enough to find both of these roles in Gillian Wightman. It is through working with her that I have begun to learn more about the internal world of someone who has been through complex childhood trauma and how the parts of ourselves that all of us experience as part of our multiple human consciousness, become more distinct and separated for traumatised people, as a result of the extra burden we have to carry in protecting us from our experience and from our memories. !! My view on mental health is that it is a continuum of human experience. All of us have low days and up days, all of us experience inner voices, we’re all aware of different aspects of our personality, one of which might be critical, another of which is playful, and all of us hold some beliefs that others don’t share. For some of us, perhaps due to experiences that we have lived through and been unable to digest, these shared experiences move to the higher end of the continuum. Our up days may be really up and involve the grandest of hare-brained schemes; our low days may find us hatching a suicide plan. The different aspects of our sub-personalities may feel stronger than our core self and threaten to harm or overwhelm us. Rather than being a quietly critical monologue of thought, an inner voice may be projected outwards to become an external voice that shouts abuse at us. We may believe not just that people are talking about us but that they have planted a secret recording device in our living room. For all of us however, no matter where we are on the continuum, tapping can make a profound difference to our peace of mind and therefore our quality of life. Of course, if someone appears particularly fragile or distressed we need to proceed with real caution as I did with myself and as I continue to do with my clients. We should not think about working on early memories, or internal parts, or focusing on body sensations until we have established a strong relationship with the client, clear safety protocols (and for these we can add to our EFT toolbox with techniques from the field of EMDR and Somatic Trauma Therapy) and proved in gentle ways to their whole system that EFT can hold them and their emotions securely and safely. We may also need to be particularly clear about our boundaries and availability, as someone who struggles with their own boundaries may challenge these. As I have learnt more about the structure of my internal world and as I have been safely negotiated through this again and again by a skillful and experienced EFT Practitioner, I have been able to feel more comfortable with working on my own and with others using tapping and imagery to transform dark energy and distressing experiences. I still don’t work directly on memories for myself and I am cautious about working on early memories with many of my clients. Instead I find that a simple moment-by-moment witnessing approach to tapping enables the subconscious to offer up the most powerful and profound metaphorical imagery. As we tap with this imagery, it changes and transforms beautifully and we are able to release and ‘evolve away’ (as Jade Barbee would put it) the most difficult and indigestible of experiences. I would like to share with you now a personal tapping experience that I had with a younger part, which occurred 6 months after the story I related to you earlier. I was having trouble with insomnia and so I had settled down for an evening tap on this issue in the hopes that it might help me to sleep better that night. I began with general statements. ‘Even though I don’t want to sleep, even though I want to stay awake all night, even though I want to sabotage my progress by being so tired I can’t do anything I deeply and completely accept myself’. This round helped me to realize that these thoughts weren’t coming from the ‘I’, that a lot of me was happy and moving on and not at all supportive of sabotage. I changed the set up to reflect that I was addressing a ‘part’ of me and I reframed the idea of sabotage as protection. ‘Even thought there’s a part of me that still wants to protect me and this is the best way it knows how, I deeply and completely accept that part. Even though there’s a part of me that’s keeping me awake because it’s scared of what will happen if I succeed, I deeply and completely accept all parts of myself. Even though parts of me are in conflict about staying stuck and moving forward I accept myself and this conflict and I wonder if it’s possible for those parts to be in communication now’. At this point I just stopped talking and continued to tap in silence, with no expectations. Just making the intention and connection to be with a part, and then allowing a space is so important, both for us and for our clients. An empty space will invite the other to enter in. And this is what happened for me. I began to hear, or feel, these words very faintly, ‘So cold, so cold’. This first offering from a part, or from someone’s subconscious, is like a tiny thread that may then lead to something more, so we just take it as it presents itself and reflect it back with tapping. ‘So cold, so cold, so cold, so cold’, I tapped on each of the points. At this point I really didn’t know what to do, should I wait until I was in therapy or continue tapping by myself? My partner came into the room just then and so I explained what was happening and asked her if she would tap with me, and help me by repeating what I said, so that I could hear it reflected. So we began with me describing the image to her exactly as I saw it. ‘There’s a young girl, she’s blue, she’s frozen, she’s lying down, and her arm is pointing upwards.’ Immediately she asked, ‘What’s the significance of her pointing arm? Do you want to move her somewhere else?’ I was shocked how brutal and disturbing these questions felt. They were dragging me into a cognitive state of mind that I just didn’t want to be in, which just felt completely ‘wrong’. I told her that we just have to witness what is happening, accepting all parts of the image and the process, and perhaps just ask some very simple questions like, what is happening now? I told her to ask questions that would help her to see what I’m seeing. And this is what we must all remember when working with clients. It’s very easy to get caught up in our favourite protocol or procedure but next to the clients experience none of that matters. We don’t have to ‘do’ anything, we don’t have to feel as though we need to achieve something special or impose anything on the client’s process. If we are fully present and tapping, what they’re experiencing will change and as it changes their cognition about that experience will change, even their memory of it will change, naturally, easily and individually in a way that is safe and right for them. The client is the expert on themselves, and given the opportunity, their subconscious will lead them toward healing and release more effectively and more safely than anything we could possibly plan or think of. And so my partner and I just sat together and tapped as she asked me very simple questions. ‘What do you see now? What else do you notice?’ ‘It’s blue; everything is blue, the light, the girl, the road. She’s wearing a nighty and she’s lying on the road. It feels like there’s been a car accident. And it’s very cold, it’s so cold.’ And then I started to cry, because it was so cold and she was so cold and I couldn’t help her. ‘Can you touch her?’ my partner asked. ‘No’, I replied, ‘I’m afraid, I don’t want to feel her skin, I don’t want to admit I’m connected to her, or admit responsibility for her, I don’t know what to do.’ I repeated each of my answers and insights several times in order to get to a good few tapping points for each. Then my partner asked, ‘What’s happening now?’ ‘It’s starting to snow’, I said, ‘Maybe I can put a blanket over her. I can do that; I can do that to help her. Now I’m resting my head against her chest, we’re together in the snow, and the snow is getting deeper, but it’s still so hopeless, now she’s buried and I will be too. It’s so cold.’ And we continued to sit together with this feeling of hopelessness, tapping continuously. !!! !! After sitting and tapping with the devastating feeling of hopelessness for a while, allowing that to be my total focus I suddenly became aware of a change. There was a figure moving into the image and a lovely sensation of warmth. I saw long black hair belonging to a young Native American woman, who was bringing this incredible feeling of warmth with her. So I began describing this while continuing to tap, ‘She feels warm, she’s warming everything, there’s more light everywhere.’ And then there was a sensation of incredible pain in my back. It was so intense that I was doubled up in pain. This was unsettling for both of us but my partner had the courage to stick to the simple instructions I had given her and continued asking gentle questions about what was happening in the image. She asked, ‘What is happening now? What else do you notice?’ I realized that the woman could help me and replied in delight, ‘She warms things; she’s warming my back and it’s healing the pain.’ Then the snow began to melt. And then, the most extraordinary, wonderful thing happened. A tiny, shy girl, peeked around the woman to show herself to me, she was radiantly beautiful, almost too beautiful to look at, her arm was resting on a big cat, a lion or a tiger. The blue, frozen corpse had transformed into this golden child. The child still felt unreachable, at no point did it feel right to reach out for her let alone to tap on her, but somehow that felt ‘right’. By now the whole landscape had become dry and warm, I was aware of sandy ground and big rocks, there was a whole group of women now, standing to one side. The stark, dark grieving landscape had become a safe, healing nurturing place. I moved out of mindfulness momentarily and started to worry about the ‘process’, shouldn’t I be thinking about integration or something right now? I needn’t have worried because I was continuing to tap, and just with that thought the tiny golden girl appeared to be moving towards me and as she walked I observed her growing older and older. As she moved closer I could feel the big ‘catness’, it was a lion, I could feel it’s fur, it’s warmth and it’s strength. And when it joined me I felt whole and knew that it’s energy had integrated with mine with no need for pressure or outward encouragement. I found myself looking into the future and saw myself there filled with this great lion energy, warm, golden and bounding around. We ended the session here. After we were done I yawned like I have never yawned before and slept all the way through the night for the first time in 4 weeks. What we can take from this example is that working with the inner world and inner selves using EFT, imagery and metaphor is a gentle, yet powerfully transformative technique that can bring profound healing to all parts of ourselves. And all that is required to work in this way is the courage to be with ourselves, or our clients, to accept, acknowledge and allow their reality as they experience it, and to use pure and simple EFT to reflect and give back their exact words through the tapping. Just as we need to be cautious not to offer a re-frame too early on, we should time our suggestion to bring in resources carefully. In this example my partner didn’t know that she could suggest bringing in a resource but we just kept on tapping and the resource appeared. For people who have lived through dark experiences their session with us may be the first and only time they get to fully acknowledge the terror and hopelessness of their emotions. We need to allow them the space and time to do this safely, if we rush in to ‘fix things’ too soon, we will deny them this crucial healing experience and the opportunity for true emotional alchemy. We need to separate from our own beliefs and prejudices in order to work in this way and we need to be able to practice nonattachment to any one particular protocol, procedure or technique. When working with people who have suffered complex trauma we need to have an awareness and understanding of just how complicated, fragmented and disturbing their inner world and inner selves or voices might be. We need to be prepared to work at a snail’s pace, to keep putting the brakes on, to use protective distancing, to chop and change technique, or to drop all technique. We need to work responsively and responsibly. I have been so fortunate to find an EFT practitioner who is fearless in working with me through my issues and accompanying me through this challenging landscape. We still have some work to do but now that my internal system knows I am listening and knows that I have learnt how to help, it has quietened right down. I feel balanced and calm and present, I can experience joy and love and hope again. For me, as is the case for many others, my mental health challenges were a direct result of experiencing that which could not be digested by my self. My being was constantly seeking to digest and to make sense and meaning out of what had happened to me, at the same time as trying to protect me from ever knowing that anything bad had happened. The resulting chaos became my symptoms. What I would like to leave you with is a renewed picture of the effectiveness of simply being mindfully present with yourself or another, listening deeply and without judgement, and tapping. We have been told never to go where we don’t belong but I would ask us to reconsider where we do belong. If mental health is a continuum and all experiences are human experiences, then surely we can find a relation and relationship to every sort of experience that any human has, even if at first those experiences appear strange, alien or frightening. Soteria House was an experimental project led by Dr Loren Mosher in the US, which aimed to provide an alternative therapeutic environment for people who had been diagnosed with schizophrenia. The people who helped in the house weren’t trained mental health professionals but ordinary students who simply sought to provide a normalizing and nurturing environment for the residents. Their priority was not to medicate or analyse but to build relationship. This project was extremely successful and its model has since been replicated in other countries. It provides an evidence base that neither experts nor medication are needed to help someone through a psychotic crisis. If simply having the courage to be present with someone who is in acute mental or emotional distress can profoundly help them, imagine what can be achieved if we had the courage to tap with them as well? !! It’s incredible to me now as I look back, just how much things have changed since I gave this presentation. If I was on a path and found myself finally ‘out of the woods’ and able to see clearly again when I wrote the above words, it is now as though I am on a different path altogether. I have no interest in or connection to diagnoses, disorders, medication or psychiatry. Not only do I feel very different, I don’t feel connected energetically to the person I was describing. I know it was me, I know it was my history, I know I lived through it and I honour myself for that, I wouldn’t change any of it, it has bought me to where I am today. However, and I think this is the key, it no longer holds any power over me, I am no longer trapped or limited by my experiences as I once was. In fact it has made me whole, with greater strength, more resources and increased resilience. I had no idea when I spoke at Craiglands that it would be recorded and that people would continue to listen via the internet for months afterwards. It has been a great honour to hear that the story I told has bought hope and comfort to so many. There are just a few things I would like to say to anyone whose own story resonates with mine and is hoping to use EFT in a similar way to approach their problems. Firstly, while EFT seems to work for most people most of the time, it won’t suit everyone. In my opinion and personal experience, it is the gentlest and most effective trauma therapy out there but thankfully there are now many, many helpful ways to move through and release trauma from our minds and bodies and the field is growing all the time. Shop around to see what really calls and connects to you. Many times it is a connection to a practitioner rather than a particular therapy that provides the key to our healing. Trust your instinct on who or what will work for you. You are unique and your healing journey will be too. Secondly, even though EFT does seem to be an incredibly powerful healing tool, I am convinced that I would not have made the very fast progress that I made without some key foundational factors being present. I was in a very strong, stable, long-term, loving relationship. I felt safe and secure in my home and local environment. I had given up the pressure of a full-time job but still had structure and purpose from working part-time in a local shop. I also took the pressure off my overwhelmed body by removing gluten, alcohol and caffeine from my diet. Structure, purpose, connection to community and diet are well proven as effective aspects of recovery from mood disorders and I would recommend them for anyone. However if you didn’t attend to these points you could probably still make very good progress with EFT. The first two factors I mention are far more important. It’s my feeling that without being in ‘relationship’ (if you’ve never been in ‘good’ relationship to another) or in a place of safety, your progress is going to be slower. One of the most brilliant things about EFT is that it is primarily a Self-Help tool, but for anyone who has lived through trauma, or the other kinds of life experience that can lead to the emotional distress that gets labelled as ‘mental illness’, relationship is going to be a key factor in our recovery. I had a great mistrust of ‘professionals’ in every form so for me it was a personal relationship that provided adequate support for me to do the work I needed to do. This was enough for me because even though trauma was part of the picture in my childhood it wasn’t the whole picture, I still managed to get ‘good enough’ parenting. If you are not in a relationship, or not in a relationship that could support you in your recovery, or if you haven’t had the good fortune of ‘good enough’ parenting then you may need the support of a long term therapeutic relationship in addition to any other healing tools. Look for a counsellor or psychotherapist who you can relate to, if you can’t find one who uses EFT introduce them to tapping! Or look for an EFT practitioner who has the additional skills and qualifications necessary to be in a long term, therapeutic relationship. Our minds and bodies are designed to resolve and release trauma naturally but it is much more difficult for us to ‘tap’ into this natural process if we have not reached a place of actual physical safety. If you don’t feel you’re in that place yet, give yourself time and support yourself with tapping until you get there. It’s important to stay in the present until we can go back to the past. And if our present is unsafe and unstable, if we haven’t perhaps left the scene of the trauma, or the trauma is continuing, it is even more important to begin our healing by tapping for that to change. Thirdly, EFT of the kind you learn from a manual on the internet, does not equip you well enough to deal with something as complex as PTSD, depression and dissociation. 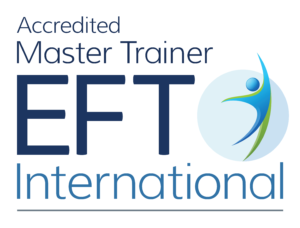 I needed to learn from and work with an EFT practitioner who was experienced in this field and I found it invaluable to complete the training with an EFT Master and study all of Gary Craig’s training library. I also found some other therapies very helpful. Reiki and Bach Flower Remedies flooded my system with positive energy, which together with EFT helped to counteract the burden of negative energy that I was generating and attracting. A short programme of PICT (Parks Inner Child Therapy) provided education and ‘re-programming’ for some of the damaged parts of me at a time towards the beginning of recovery when I had no energy at all to tap for myself. I am aware that there is another level of recovery still to come and this will be at an even deeper body level. I’m just beginning to experiment (on myself) with ways of bringing EFT to this. Lastly, there are several times in this presentation when I refer to tapping on the finger points. When I tap on the finger points, I always include the side of the hand and often the gamut point too. It feels to me that these two points have a greatly calming and powerfully integrating effect. Without these points, I can find that tapping on the fingers alone can have a stimulating effect, which is useful when I’m jogging, but not when I’m in a state of anxiety! This is a personal observation, but I draw attention to my experience in case the same may apply to other people, especially people suffering from anxiety disorders or PTSD. I wish you all great blessings and great courage on your own journeys. Thank you for sharing your experience. I was moved by your story. It gave more understanding about EFT to trust the process rather than feel responsible and oriented to achieve something. I am in the process to learn to trust more the Process, Field, God, Universe rather than feel the need to be in control. I struggle with this issue of being in control which makes me suffer of distress and anxiety. I do self-reiki treatments and EFT irregularly. At times, i have my doubts about these treatments as i would want immediate results. I am too scared to go to places where i have never been before. I stop myself from leaving the spot even if it means emotional suffering and anxiety. I choose to remain there, my feet rooted in the ground as i feel there is some form of safety. It took me years to change past workplace. From time to time, i still feel upset for leaving the past workplace. The working field was at my heart. I had to leave as there was lack of structure. At times, i experience anger for my decision to resign and move into a more generic service. I feel there are chains which do not allow clients to benefit more. I will take your support to continue tapping regularly and be open to anything there is in store. I know that i am not walking this journey alone although at times i experience doubts about the existence of someone higher, wiser and bigger than me. Thank you for your deeply felt comment Reuben. Yes there is a lot of hype around EFT which leads people to expect immediate and total transformation, the reality is change a little step at a time.